With ASP.NET Core 2 around the corner, the hottest new thing that we are getting is Razor Pages. In one of the previous posts, we briefly mentioned ASP.NET Core Razor Pages. Initial impression of the public was that Razor Pages is easier and faster alternative to MVC for smaller apps that are solely page focused. However, it turns out that it just might be bigger than that. 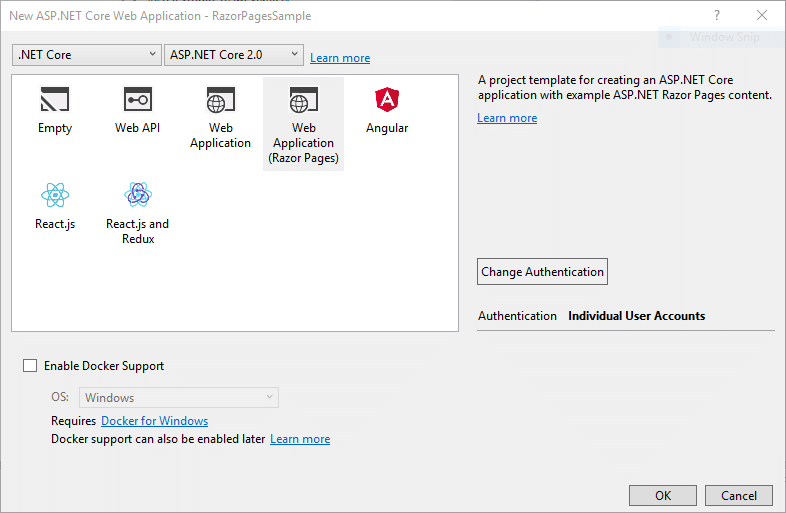 Since Razor Pages with ASP.NET Core 2 will be a default option when creating new apps (Empty, Razor Pages, Web API, MVC), it seems that ASP.NET team has big plans for Razor Pages and wants it to be #1 option when creating new web applications. All of the Razor Pages types and features live in the Microsoft.AspNetCore.Mvc.RazorPages assembly. The MVC package – Microsoft.AspNetCore.Mvc includes the Razor Pages assembly. That means that you can use Razor Pages out of the box with MVC. One of the advantages of Razor Pages is that it is straightforward to set up and get going. You create a new empty project, you add Pages folder, you add the Page, and you just write code and markup inside of your .cshtml file. Excellent for newcomers and an easy and fast way to learn about ASP.NET Core! 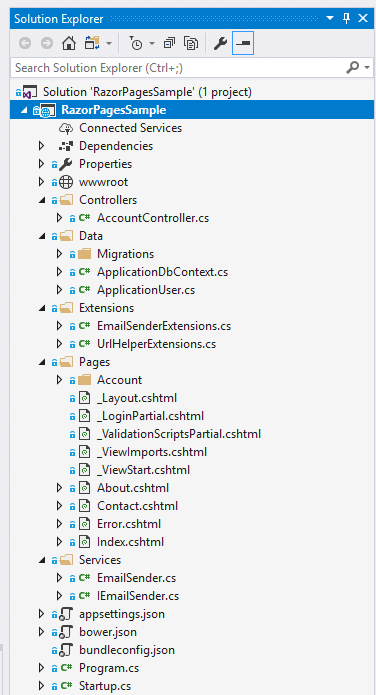 If you want to build few simple pages with MVC, you have controller actions in separate place, HTML for view in separate place, ViewModel in a different location, routes in separate place, and that just seems like too much. I did manually select Individual User Accounts as authentication type. Default location for Pages is Pages folder, but that can be changed. Inside of .cs files, we can define our logic, Handlers (actions), Model and all needed logic. We can also use it only as glue to the actual .cshtml page and handle only GET/POST/PUT/DELETE, and move the logic to separate class or layer/project. Since Razor Pages is part of the MVC stack, we can use anything that comes with MVC inside of our Razor Pages. 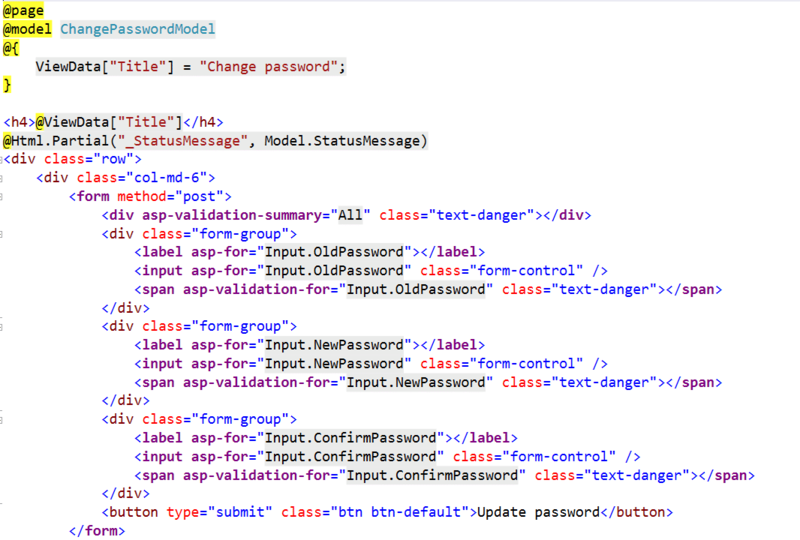 Model binding that we know from MVC also works with Razor Pages. Just like Action Methods in MVC Controllers, we have Handlers in Razor Pages code. 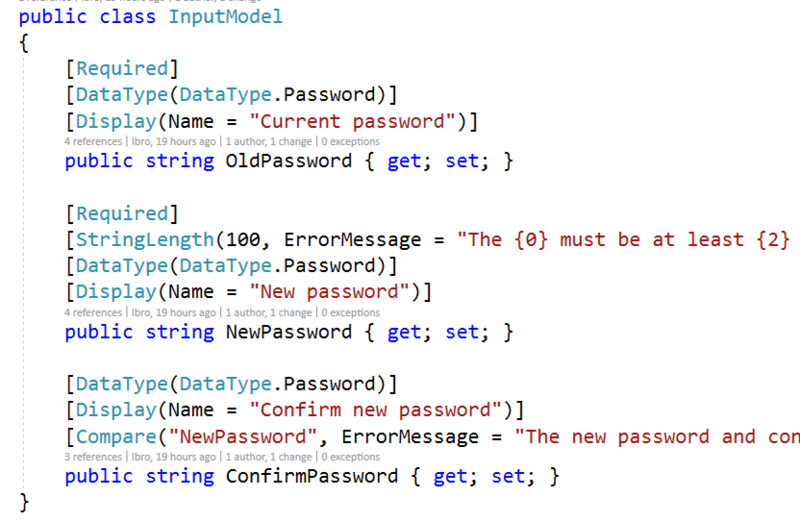 InputModel serves the function of ViewModel that we are accustomed to from MVC. These will be automatically picked up by ASP.NET Core based on the type of HTTP request. The OnGetAsync and OnPostAsync are convention based names for Razor Pages handlers. 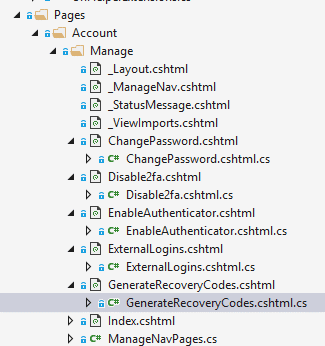 Once you open the ChangePassword Page code inside of the OnGetAsync handler will execute. 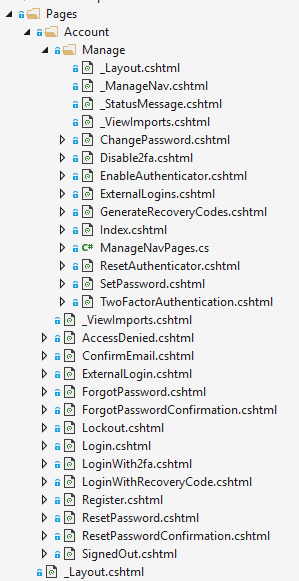 And once you submit a form from ChangePassword.cshtml page the OnPostAsync handler gets triggered. The key to this is @functions directive, which enables function-level content inside of our Razor file. We can also use all of existing Tag Helpers and HTML helpers inside of our Razor Pages. Also, we can create our own and use them within Razor Page. I have small project setup at GitHub showing how can we do CRUD with Razor Pages – repository here. You do need .NET Core 2.0 Preview 3 (build 6764 should just work) or later and Visual Studio 2017.3 or later. Besides two standard files Program.cs and Startup.cs everything is in Pages folder! Do notice that some of the Pages have matching code behind file. As we mentioned previously, the location (path in the filesystem) of the Page in the project will determine the matching URL.